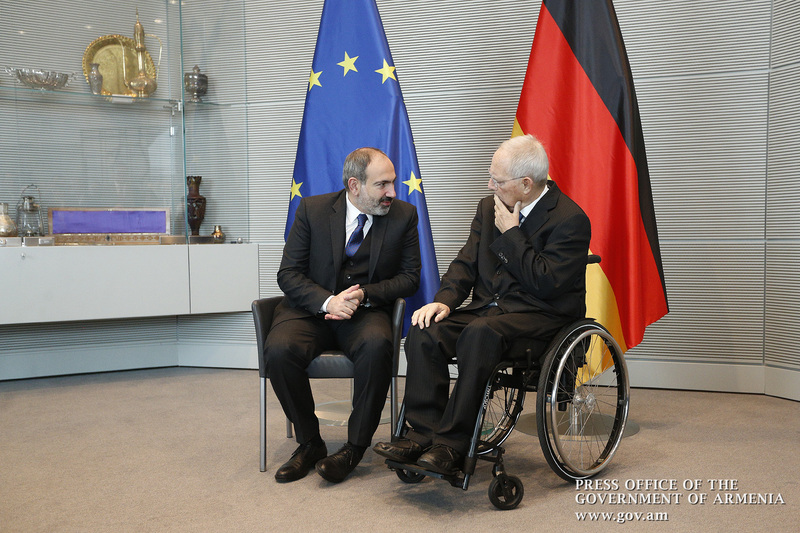 As part of his official visit to the Federal Republic of Germany, Prime Minister Nikol Pashinyan today met with German Bundestag President Wolfgang Schäuble. 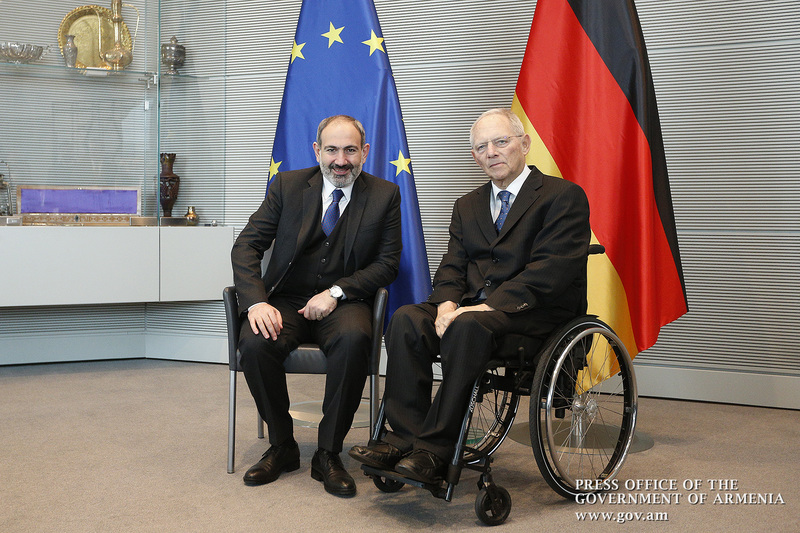 Wolfgang Schäuble considered it a great honor for him to host the Prime Minister of Armenia in Germany and discuss issues of cooperation between the two countries. Nikol Pashinyan gave details of those processes underway in our country, stressing that the first stage of the Armenian revolution ended with the parliamentary elections of December 9, 2018, and now the time has come for an economic revolution. “Democracy is irreversible in Armenia. After implementing political transformations, we need to make economic changes, because the next important component of a revolution’s success is economic development,” the Premier said. The parties hailed the current level of political dialogue between the two countries. They stressed the importance of deepening and strengthening inter-parliamentary ties amid rapidly developing Armenian-German interstate relations. 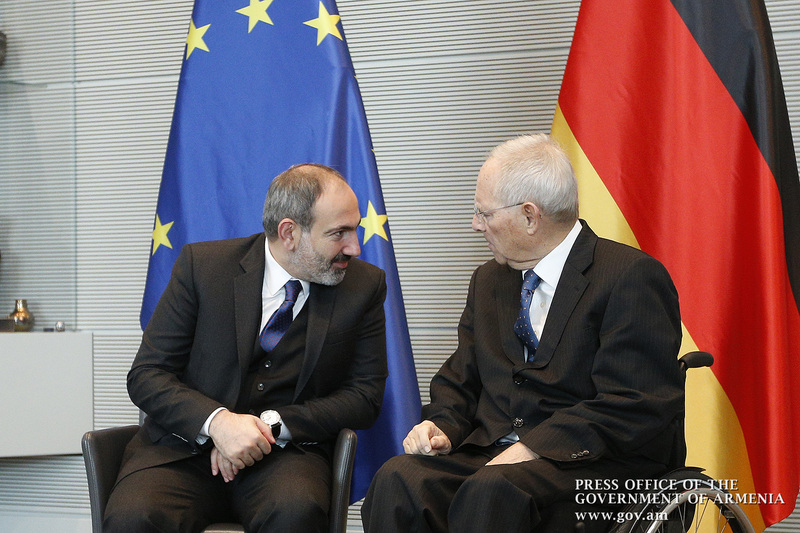 Nikol Pashinyan advised that Armenia has embraced a full-fledged system of parliamentary governance, and Germany’s experience as a country with well-established parliamentary traditions is exemplary. In this context, he stressed the need for building closer contacts with German parliamentarians. 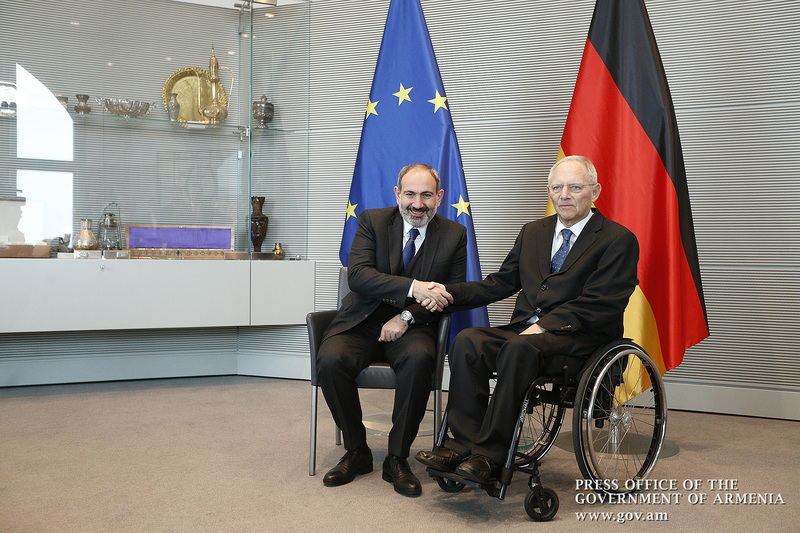 In turn, Wolfgang Schäuble pointed out that Armenia is an important partner for Germany, and his country is ready to share the wealth of its experience and success stories in parliamentary government. 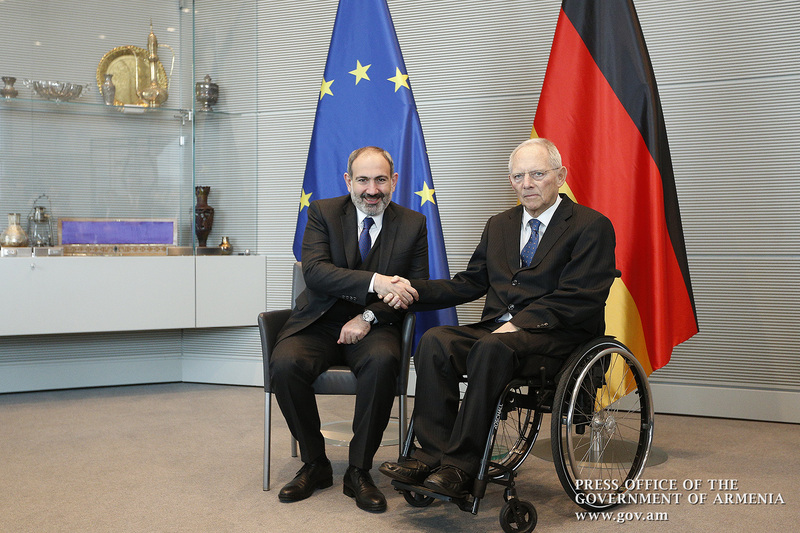 The Armenian Prime Minister and the Bundestag President discussed the prospects for EU-Armenia cooperation, which entered a new phase after the signing of the Comprehensive and Enhanced Partnership Agreement (CEPA) between Armenia and the EU. Nikol Pashinyan stressed the importance of soonest possible ratification of the agreement by EU member states. During the meeting, the parties exchanged views on the furtherance of Armenian-German interaction, development of EU-Armenia relations and the Comprehensive and Enhanced Partnership Agreement. 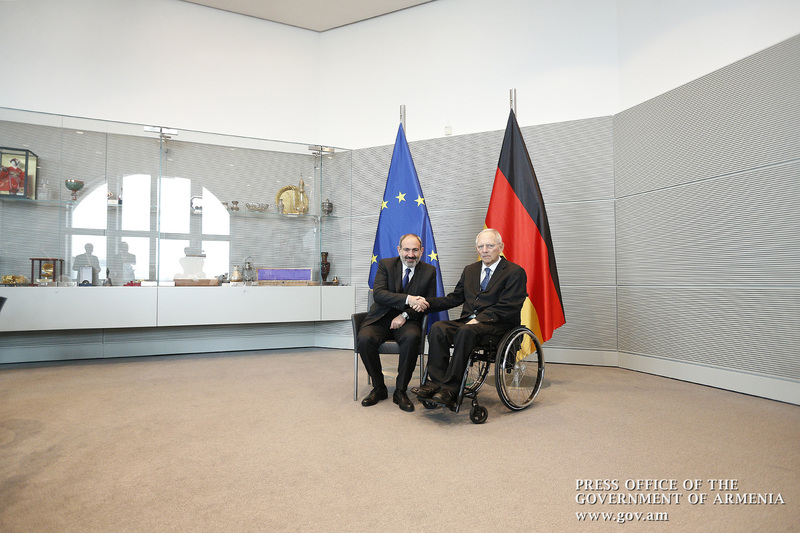 Prime Minister Pashinyan took the opportunity to praise the adoption by the Bundestag of a resolution condemning the Armenian Genocide.